The Intermediate School New Extension 1911-1980s. 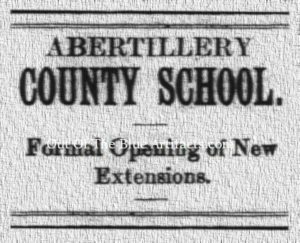 On Wednesday 20th December 1911 the new extensions at the Abertillery Intermediate School were opened. The extensions consisted of north and south wings along with an added back section. In the north section extra classrooms were added to provide for an extra 116 pupils, with folding partitions between two rooms on the first floor. The south section contained new physics and science laboratories, boiler room, toilets, cloakroom and classes, headmasters private room. The rear section included a cloakroom and an entrance directly into the main assembly hall from a walkway behind the school. The school could now accommodate 250 pupils. The elevations were of blue pennant stone with Bath stone dressings. A new heating apparatus was installed throughout the old and new rooms, it was installed by the Engineer Mr E. Perman of Newport. The laboratories were splendidly fitted by Messrs The Bennett Furnishing Co of Glengall Road, London. The contractor was Mr John Morgan from Blaenavon. 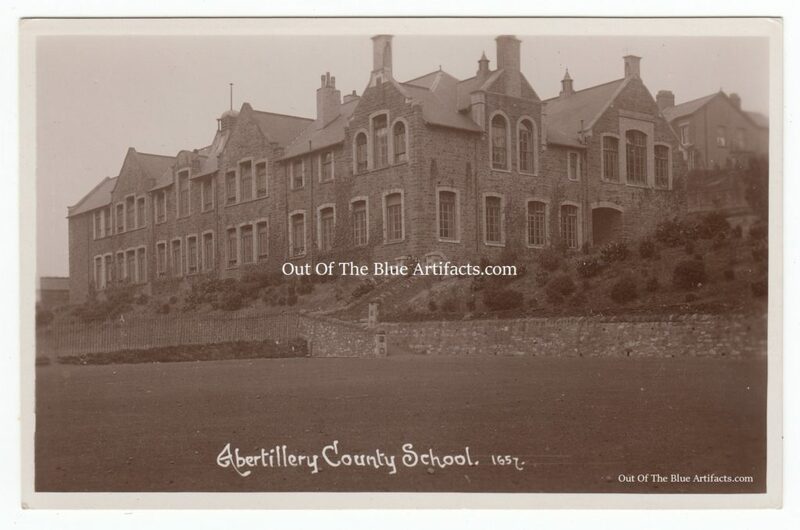 The school was remodelled by the architect Mr R. L. Roberts of Abercarn. The clerk of the works was Mr C. Locke of 136 Caerleon Road, Newport. Tuition Fees – 17s. 6d. per term, payable in advance. books and stationary extra average cost from 15s. to 17s. 6d. per annum. Mr N. J. Llewellyn was clerk of the governors. Following is a link back to the Old School – Original School Building. Following is a Link to – The History of the Intermedate School. The need for a local technical school at Abertillery came up in an educational meeting as early as May 1928, up until this date the mechanical, engineering, civil, motor engineering mining part of education was all based in Crumlin or Pontllanfraith. September 1928 it was announced that the building of a technical school was to go ahead, planning was to be applied for and the site at Spring Bank, Abertillery was chosen. The Official Opening of the Technical School, Abertillery. On Wednesday 16th April 1930 the Technical School at Spring Bank, Abertillery was completed. Its official name was The Abertillery Technical Institute and Mining School. It was officially opened by Alderman Levi Harris J.P. chairman of the Sites and Buildings Committee of the Monmouthshire County Council. Situated on a commanding view at Spring Bank, Blaenau Gwent the new building was erected at a cost of £5,500 with the assistance of financial aid from the Miners Welfare Scheme. The Contractor and Architect of the Technical School. The contractors were Messrs Weaver and Co, Abertillery. The architect was Mr John Bain F.R.I.B.A. The clerk of the works was Mr D. W. Price. The school extensions comprised of a chemist laboratory, drawing room, physics laboratory, lecture rooms, developing room, store room, masters room, cloak room etc. In the basement were the metal working room, smithy and workshops, boiler room and stores. The grounds were fenced off with pathways and shrubberies. The Educational Committee advertised for lecturer’s for the new Technical and Mining Institute at Abertillery. The following gentlemen applied for the post – Mr T. Elkins of Aberbeeg; Mr B. I. Evans of Rhymney and Mr W. J. Robins B.Sc. of Sirhowy: The sub-committee recommend that Mr W. J. Robins B.Sc. be appointed lecturer-in charge of the Technical and Mining Institute, his appointment was full time and he was required to teach day and evening classes as directed and would be responsible for the supervision and general organisation of the institute. The first staff were as follows – Mr W. J. Robins B.Sc. Hons London (Lecturer-in-Charge); Mr R. H. Hanney A.M. Inst. C.E. Dips Mech and Civil Engineer and Mr A. S. Harding B.Sc. F.G.S Assistants. In the early 1970’s the Intermediate County School was turned into a Junior Comprehensive School, pupils attending ranging from 11 to 13 years of age before leaving to attend the Nantyglo Comprehensive School which opened in 1972 to receive pupils 14 to 16 years of age. The Rose Heyworth Comprehensive (late County School) closed in about 1988 and was demolished. The Technical School building closed as a school at the same time and was turned into a Magistrates Court for Abertillery but eventually closed in about 2010 and was demolished. To this day nothing has been built on the either site.